Keep bees out of the nectar in your existing Parasol hummingbird feeder using the Parasol Bee Proof Flower Feeding Tube. 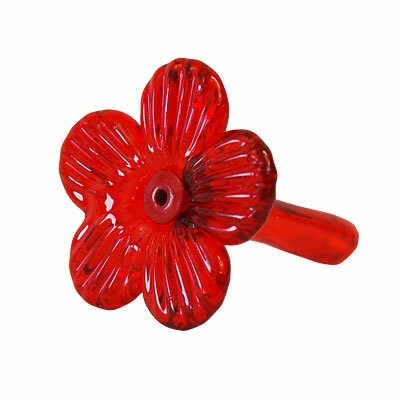 This blown glass feeding flower nestles perfectly into many of the Parasol hummingbird feeders (not included), and its red color helps attract the birds. A plastic insert in the center of this tube blocks bees, preventing them from entering your feeder, while still allowing the birds to feed. Maintain your Parasol hummingbird feeder and deter bees with this Bee Proof Flower Feeding Tube.